The dishtowel just might have to be youfrillme’s mascot with all the fun DIYs we are coming up with this summer! In May, Fran wrote a post about embellishing your dishtowel with applique, and in June I posted a video tutorial on the blanket stitch. Today I’m bringing you a DIY to add to these last two projects. I made these for a friend’s wedding gift in June. You might remember them from the blanket stitch post. Notice the fun fabric border I added to the bottom of the dishtowel. This is what I’m going to show you how to do today, and I promise, it’s really simple! So get out the dishtowel that you used to learn about applique and the blanket stitch, and follow along as my friend, Tia, learns how to add this final frill to her own project! Choose your fabric, and cut it about 2” lengthwise and about 4” wider than the width of the bottom portion of your dishtowel. Make sure everything is ironed and ready for pinning. 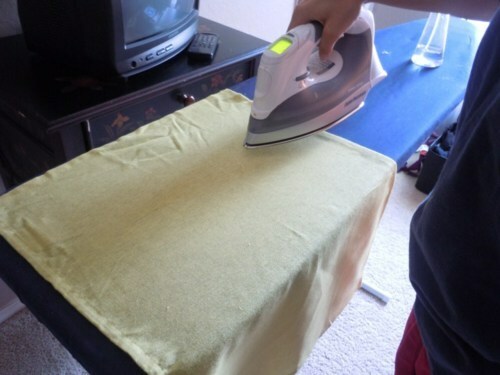 Press (iron) each long side of your fabric over about 1/4”. 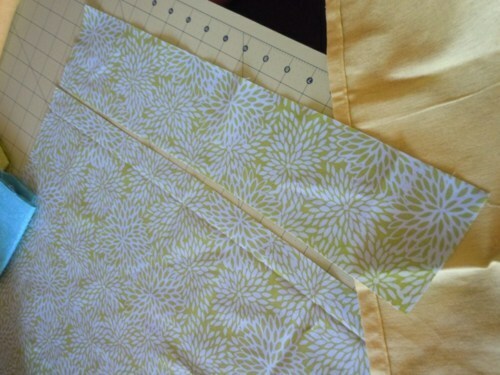 THEN, fold over again to make a 1/2” hem and press. Notice that we only made one fold here. This was a mistake. If you don’t fold it twice, your towel will fray! 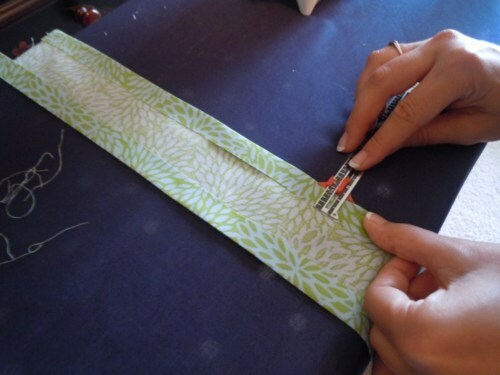 Sew each pinned side on the right side of the fabric, removing the pins as you go. 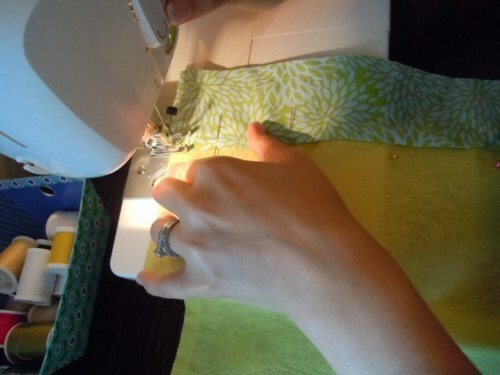 Pin your fabric onto the bottom of one side of your dishtowel. Leave 2” hanging off each side. 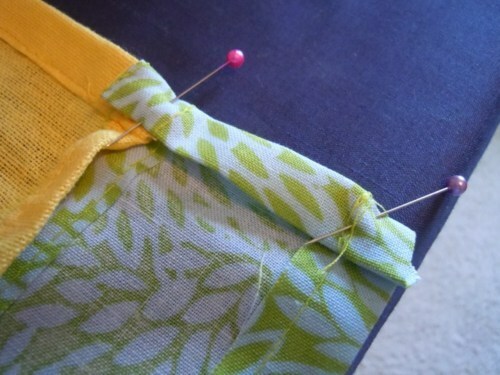 Sew the pinned side onto the right side of the dishtowel, removing each pin as you go. 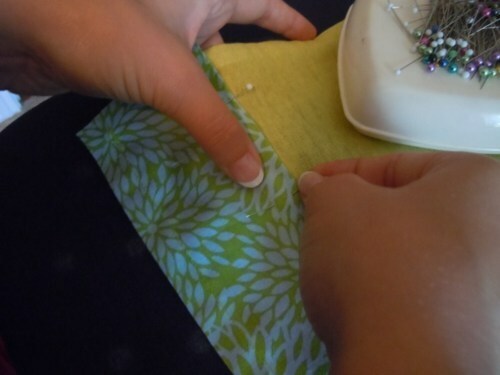 On the wrong side of the fabric and dishtowel, make a 1/4” fold and press. Then fold the rest of the fabric over making it even with the seam on the dishtowel. Press and pin. Step 9: Oops, no picture! Sew each side down, removing the pins as you go! Step 10: Enjoy your newly frilled up dishtowel. And don’t forget to add the applique and blanket stitch! Check out Tia’s almost finished product. 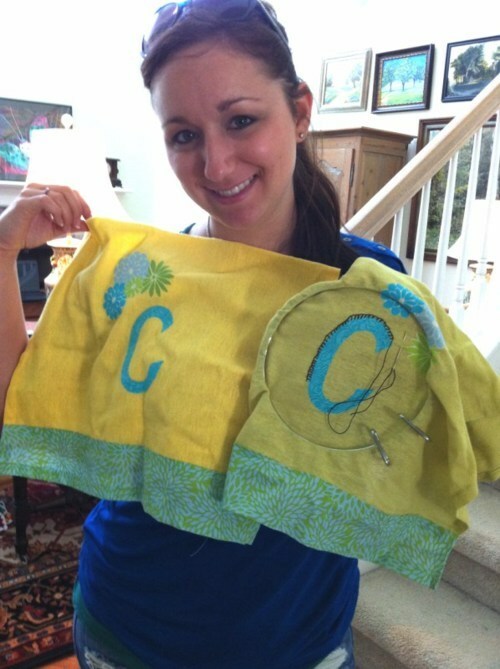 She decided to go with a monogrammed applique she cut out herself, and is learning how to do the very easy blanket stitch. Great job, Tia! For a ruffled finish to your fabric, simply cut the fabric about 2 1/2 times longer than the width of the bottom of your dishtowel. Then, follow all of the directions on this DIY, but when it comes time to pin your fabric to your dishtowel, instead of pinning evenly, pin the fabric making little folds. When you sew your seam, your fabric will begin to ruffle! Recently I learned a new stitch, the blanket stitch, and since then, I’ve been going blanket-stitch-crazy! My favorite thing about it is that it’s EASY and frills up whatever project you might be working on. I’ve been adding it to all of my applique projects. 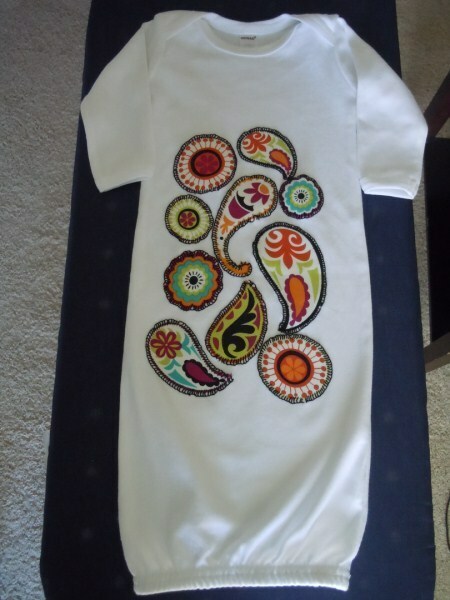 Remember the DIY post Fran wrote on embellishing with applique? You really ought to go back to it before you watch this video tutorial I made on the blanket stitch. 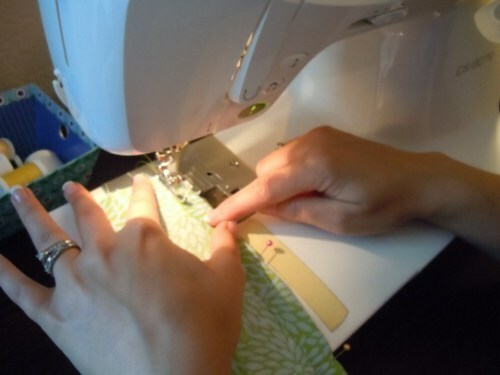 Once you’ve learned about both, you will be able to do lots of fun and easy sewing without needing a sewing machine! Check out all of the fun things I’ve been working on using applique and the blanket stitch, and then watch my video tutorial so you can join in on the fun! 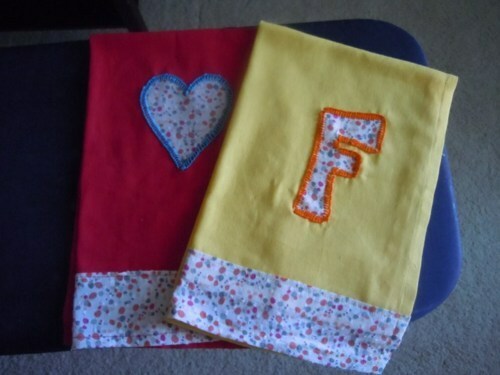 I made these dish towels as a wedding gift using applique and the blanket stitch. I also added some extra frills on the bottom with leftover fabric. It’s been my experience that a girl can never have enough pretty dishtowels. I made this dishtowel for part of my sister’s housewarming gift. 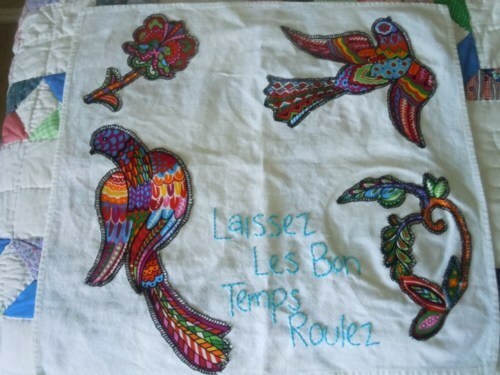 She just moved back to our home state of Louisiana which explains the embroidering in French meaning, “Let the Good Times Roll”. The next two items are a baby gift for one of my dearest friends and her newly born daughter. 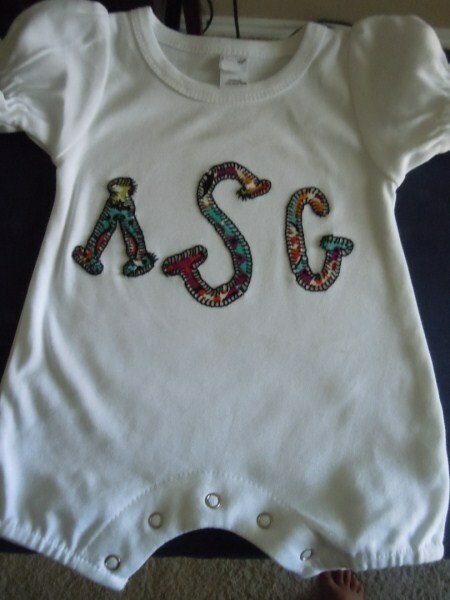 The gown has fun designs, and I used the same fabric to cut out a monogram for the jumper. 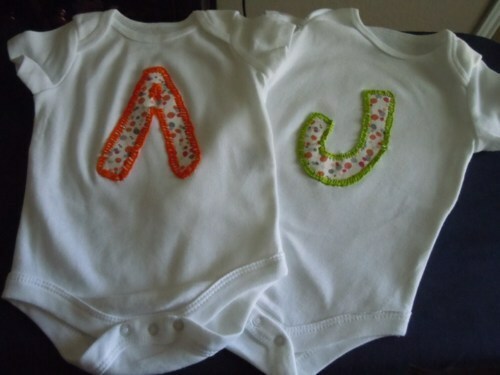 Finally, I made these onesies for another sweet friend and her newly born twins. These aren’t completed yet. I’m adding ruffles to the butts as soon as I get time! Sold yet? Check out this video tutorial to learn more!